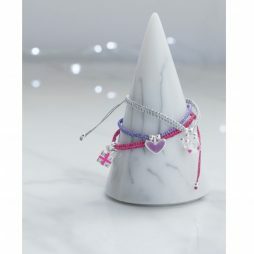 Joma Jewellery Girls is the new incredible UK designed collection of silver plated jewellery for children featuring bracelets and necklaces with a heartfelt message. This new collection is filled to the brim with magic and sparkle, from fairy queens to happy penguins, with the best of sentiments to create the ideal gifts. All Joma Jewellery Girls Jewellery is lovingly presented for you in a pretty Joma Jewellery Girls ribbon tied gift bag with free gift tag. 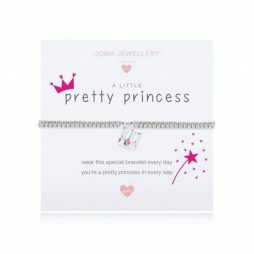 Children's Jewellery, Joma Jewellery a little, Joma Jewellery, Joma Jewellery Girls. 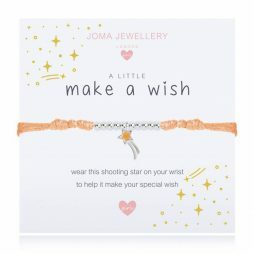 A lovely girl’s bracelet has the sentiment, “wear this shooting star on your wrist to help it make your special wish”, on the white and yellow stars gift card. This bracelet features an orange enamel shooting star charm on an adjustable, orange thread bracelet. 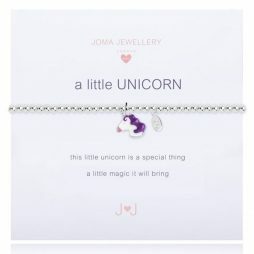 Silver Bracelet,detailed with a white and purple unicorn charm with the words ‘this little unicorn is a special thing a little magic it will bring’. . Suitable for age 3 to 12 years. Very impressed with the speed of service, ordered an item on the Monday here on the Wednesday (standard post) also with a 20% discount that was running, certainly use you again. Thank you so much.